This 16" Versatile Dovetail Plate is exceptionally strong, providing a rigid structure to your heaviest payloads. It can be used with our DOVEDV10 and the DOVELM162 saddle plates (earlier versions of the DOVELM16x require the minor modification outlined below). It can also be used with many other Losmandy D-style Saddle Plates. Astro-Physics mounting rings with 2.362" (60 mm) or 4.5" hole spacing. 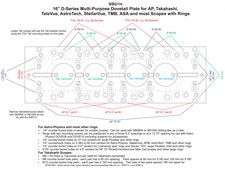 Note: The 3.2" hole spacing of Astro-Physics rings requires using the SBDAPB AP Riser Blocks with this plate. Weight: 4.2 lb. (1.9 kg) The plate is ribbed on one side to reduce weight. Please click on the thumbnail to review the detailed diagram and confirm that your rings are appropriate to use this plate. Important: Due to the 5" width of the SBD16 Versatile Dovetail Plate, its use with the pre-March 2007 design of the 16" Dovetail Saddle Plate (DOVELM16x) will require a minor modification of the locking clamp assemblies to ensure that the plate seats and locks properly. See linked PDF file.